A fine Hydrographic Office chart no. 2088 (2198), showing the coast with shepstone, Scottsburg and Durban formerly Port Natal. Engraved by Edw.d Weller. London : Published at the Admiralty 1.st July, 1873, under the Superintendence of Rear Admiral G. H. Richards... Hydrographer : Sold by J.D. Potter agent for the Admiralty charts, 31 Poultry & 11 King Street, Tower Hill". Magnetic variation in 1900 decreasing about 2' annually". 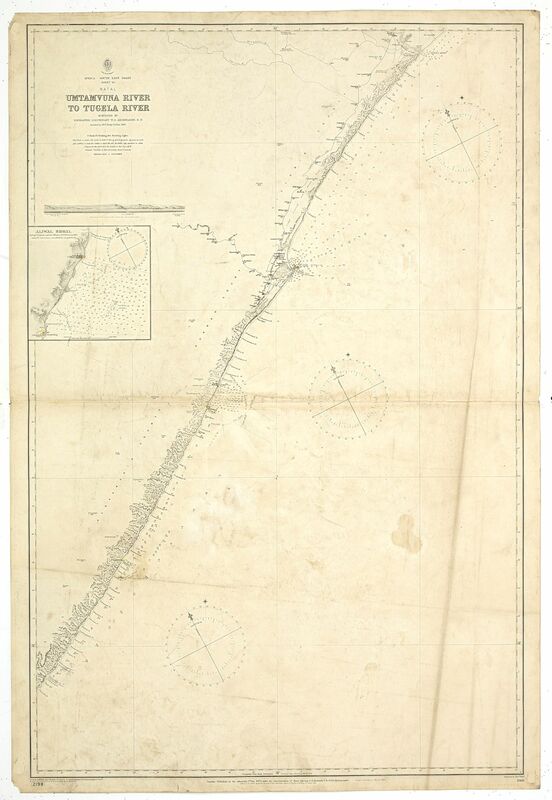 With one inset : "Aliwal Shoal".